Two years ago, Amazon introduced the Kindle Fire. It was the first affordable color tablet offered by a major hardware manufacturer, and certainly the first respectable tablet that fit in a coat pocket. But it was also a Version 1. The first Fire was thick and heavy, and poor responsiveness was a common complaint—even among long-time Android users, who were already used to a certain gap between Thought and Action where multitouch was concerned. 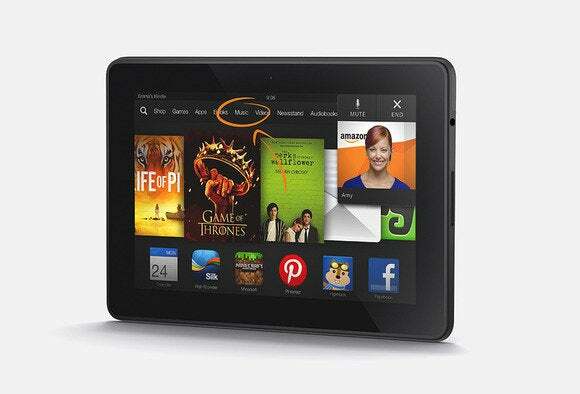 On Tuesday, Amazon announced the Kindle Fire HDX. “We’ve learned a lot in the past two years,” I was told by an Amazon rep during an afternoon of demos. And that learning is reflected in the feature sets of two Fire HDX versions, shipping in the middle of October. Not only are Amazon’s tablets faster and prettier than ever before, they’re also loaded with nifty new features for “second screen” video viewing, as well as a real-time video tech support feature that must be seen to be believed. The 7-inch edition has a 1920-by-1200 display boasting 323 pixels per inch, and will sell for $229 for the base 16GB model. The 8.9-inch version will run you $379, and sports a 2560-by-1600, 339 ppi display. The new screens are easier to read in harsh sunlight thanks to brighter displays, as well as a new dynamic contrast control that kicks in to increase the brightness of shadow areas in onscreen images (it works in both photos and HD video). Both new Kindle Fire HDX models pack insane pixel density. Alas, my hardware hands-on took place in Amazon’s Seattle HQ, where bright sunlight was not in abundance. But shining an ultra-bright flashlight into the light sensor while a photo of the Grand Canyon was on the display caused the highlights of the image to remain steady while the HDX increased the levels of the shadows. Another welcome addition: True, 100 percent sRGB color accuracy. I wasn’t able to load my own content on the sample devices, but I’m familiar with the color performance of the 2012 Kindle, and I saw an immediate improvement. Amazon also reduced the distance between the pixels and the top cover. Put it all together, and the result is a crisp, saturated, lively screen with plenty of detail and no visible pixels to be found anywhere, even in web content. Both of the HDX models use the new quad-core Snapdragon 800 mobile CPU, running at 2.2GHz. Amazon says that the new Fires’ overall performance is three times faster than that of the previous-generation hardware. The company also doubled the tablet’s application memory to 2GB, which speeds multitasking. Amazon says the HDX has the lowest touch latency of any Android tablet. That’s a hard claim to prove, but I’m not inclined to scoff at it. The improvements were immediately obvious the moment I took the 8.9 incher for my first spin. Between the Snapdragon CPU and the tablet’s OS upgrade to Android Jelly Bean, the Fire’s touch latency issues have disappeared. The interface was zippy, even when scrolling through carousels of HD images. It’s clear that Amazon wanted to kill the latency problem with weapons far more substantial than harsh language. Despite the pixel-packed display and faster CPU, the Fire HDX still delivers roughly 11 hours of mixed-use operation, according to Amazon. The company has also optimized the book reader app for low-power consumption by using only a single CPU core, and by shoving content into special low-power memory. Result: 17 hours of battery life as an e-reader, Amazon says. The 8.9-inch HDX gets a new 8-megapixel, f2.2 rear-facing camera that shoots stills and video, enhanced with an LED illuminator. A new custom camera app supports HDR shooting and panoramas. Though one’s expectations of a tablet camera ought to be low-ish, the component on the 8.9-inch HDX seemed to take decent, smartphone-grade photos, based on my observation of Amazon’s sample pix. Amazon has traded the conventional rounded-edges motif of last year’s Fires for sharper angles. The engineers have also thankfully decided that the Fire’s power and volume buttons should no longer be closely guarded secrets. Those buttons are now big, clearly labeled, and mounted on the back plate of the tablet, where my fingers instantly found them. The styling of the HDX tablets reminded me of the old Motorola XOOM tablet—but much, much slimmer and more stylish. New origami-style covers are available for both Fire HDX models. One element of the physical design made such an impression on me that I ended the word on my notebook page with an exclamation mark and embellished it with a circle: LIGHT! The 8.9-inch HDX feels almost bafflingly lightweight at 13.2 ounces. That makes it almost 10 ounces lighter than the 9.7-inch iPad, and only barely heavier than the 10.88 ounce iPad Mini. It feels great in the hand. No doubt some people will think it feels “cheap,” but anybody who spends hours reading books or watching movies on a tablet will love the overall lack of the sensation of heft. The HDX is “gloriously, unapologetically plastic,” to steal a line from someone getting a lot of press this month. Amazon is also rolling out a set of Origami-style covers for both Kindle HDX models. These are ultra-slim cases that can be folded and re-folded into portrait and landscape-type stands with deep or shallow angles, thanks to embedded magnets that hold the various folds together. Amazon claims to have given the Fire’s software a floor-to-ceiling rehab. You might say that the Fire team uses Android as inspiration for its own work instead of as a library of code that must be ported. Its made substantial back-end improvements, particularly in the graphics pipeline: It’s clear that Amazon wanted to kill the latency problem with weapons far more substantial than harsh language. Many long-desired features are now part of Fire OS 3.0. And, yes, now “Fire” is a formally named OS, not “the operating system formerly known as ‘whatever it is that Amazon does to Android’.” Its carousel view is backed up by an additional grid view for speeding through apps and content. A future update will allow you to group content into collections. New accessibility features make the Fire’s interface and content available to people with impaired vision. The now-iconic hamburger button has spread to the Fire, revealing a slide-out tray for menus and system settings. And Fire 3.0 has been enterprise-hardened with new support for VPN services, Kerberos authentication, and remote device management. Keyboards and other input devices are easier to use. Enterprise email and on-device encryption are here in 3.0, and wireless printing is coming soon. The signature ginchiness of the Fire has always been its focus on content. To the Fire design team, the users’ focus should be on the books they want to read, the TV shows they want to watch, and the documents that they want to edit. That’s why the content items are always presented front-and-center—instead of the apps the user needs to launch in order to use them. Amazon has upped its already considerable game by introducing big enhancements to the Kindle’s X-Ray feature. X-Ray is a collection of tools intended to help users see and appreciate the content behind the content. When it showed up as a feature for the Kindle book reader, it made it easier to follow the many characters in a sprawling novel. For example, if you saw a familiar name in a George R. R. Martin novel and thought “I thought he was dead already,” X-Ray could clear everything up for you right then and there. Want to buy the soundtrack of a show or movie you’re watching? X-Ray makes that easy. On the Fire HDX, X-Ray adds canonical song lyrics to the music player. Lyrics scroll in time with playback, and can be searched, and also used as links to scrub to specific spots in the tune. X-Ray enhancements to the Fire’s video player are way more ambitious. But first, let’s talk about second screens. Amazon Instant Video now works intimately between the Fire HDX and Amazon Instant connected devices. Instead of just being able to continue watching a movie on your living room TV from the point you left off on your Fire earlier in the day, you can also “throw” the content from the Fire and use the tablet as a dedicated second screen for X-Ray-fueled supplemental content. Caveat: The feature doesn’t work with all TVs and streaming boxes. Amazon announced support for the Xbox 360 and One, PlayStation, and certain Samsung TVs, with other compatible devices to be announced. Nonetheless, once you’ve managed to get it working, it works the same way: Your TV is now responsible for streaming your program, leaving your tablet’s CPU and battery free from anything taxing. During my hands-on demo, Amazon opened up an episode of “Boardwalk Empire” and threw it from the Fire. The tablet’s screen shifted to X-Ray mode, with multiple tabs representing different kinds of content. X-ray also shows you who’s playing whom, in real-time as you’re watching content on the big screen. The second-screen experience in action. “Boardwalk Empire” is a music-heavy show. Sure enough, every time a new tune appeared on the soundtrack, the Fire HDX told me what it was, and who composed it. It also offered me a handy link to where I could buy the track or the album on Amazon, of course. Typically, I would make a testy comment about how Amazon probably wrote the “Always Be Closing” speech from the beginning of “Glengarry Glen Ross.” And I probably should. But the fact is that I’m always buying music that I first heard on shows like this. X-Ray also pulls data from the Trivia section of your movie or TV show’s IMDB page. As with the rest of the added content, it also throws it onto the Fire’s screen at the appropriate moment. Now, as a lover of film, I’m supposed to write a long screed about how this sort of intrusion is emblematic of how unworthy our species is of the art that’s all around us. But again, I must be honest and say that I almost always visit the IMDB page of a movie for more information. X-Ray is an interesting feature, even a useful one. But the Kindle HDX’s new “Mayday” button is by far its most intriguing. You’ll find it in the main system tray, right next to the Home button. Push it. A little floating window appears above your content. And less than 14 seconds later, the window contains live video chat with an Amazon tech support person, who’s now asking you what he or she can help you with today. Jeff Bezos showed me the Mayday feature in a conference room. It appeared to be one of those “pride and joy” moments that you sometimes see from a CEO when he finally gets to talk publicly about something that genuinely excites him. There are things I’ve heard during my various tech briefings that have led me to believe I’ve misheard something. “Every Kindle HDX comes with free, 24/7 live video support” was one of those things. My live demo took place a month before the HDX even goes on sale. I realize this. But if this is the best that the feature can do, then its best is very, very good. The helper—yes, a real live person, not an avatar—could hear me but couldn’t see me. I could ask him how to connect my Bluetooth keyboard to the Fire HDX. He could see my screen and could draw on it to guide me through the steps. The helper could also (with my approval) take control and operate my device, setting the keyboard up for me as I watch. “I am so terrified for your people when this feature goes live,” I said, thinking about every tech support session I’ve given to every friend, family member, and friend of a family member ever. Press a button. Get connected to a live person (again, the target time is less than 14 seconds). Ask him or her anything. It would appear that these people will field questions of a “what game should I get?” nature by helping them find and use the Kindle’s built-in features for producing personalized recommendations. This rather than talking about personal adventures playing Angry Birds Star Wars 2.